Who doesn’t like a game that makes you laugh? 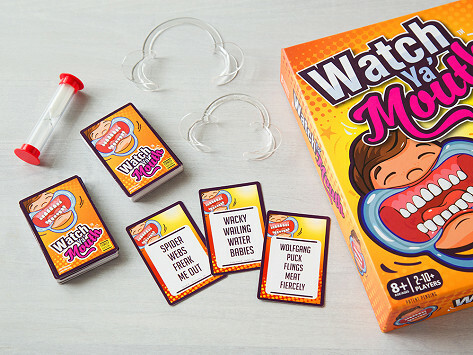 This card-based, mouth guard game encourages you to read and interpret phrases all while wearing a mouth-stretching, teeth-baring device. That’s no easy task. Silliness escalates as the phrases get harder to comprehend. Whether you’re involved in the game or cheering from the sidelines, it’s somewhat absurd but extremely entertaining. Dimensions: 10.5" x 8" x 2"
We played this on New Year's Eve with a group of 12 adults, and it was hysterical. Laughed till we cried. Great icebreaker! There are 5 girls in the family this gift was given to and they will have a blast with this game. This game is so much fun. We laughed until we cried. Now everyone I know wish they had gotten this for Christmas!